Thomas Beach, destined to become a famous portrait painter, was born in Milton Abbas in Dorset the fifth of six children of Thomas & Ursula BEACH. He was baptised there on 2nd October 1738 presumably by the vicar the Rev James MARTIN who had been appointed to the post the preceding year. His childhood covered an interesting period in the development of Milton Abbey which had been inherited by John Strachan in 1737 and who sold it to Joseph Damar later Lord Milton in 1752. He was educated at Milton Abbey School where a contemporary pupil was William Chaffin who went on to become the Rector of Chettle in 1756 and Lyndlinch in 1768. From his earliest years Thomas showed a strong predilection for art, and under the patronage of Lord Dorchester's family he became in 1760 a pupil of Sir Joshua REYNOLDS (1723-1792). 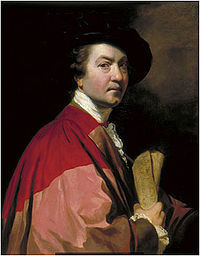 He studied in London with Joshua Reynolds (picture left) from 1760 until early in 1762, during which time he was also a student at St Martin's Lane Academy. Reynolds, having returned from studying the 'Old Masters' in Italy in 1752 had by 1760 established himself as a portrait painter of some renown. He worked long hours in his studio, was both gregarious and keenly intellectual and had a great number of friends from London's intelligentsia, numbered amongst whom were Dr Samuel Johnson, Oliver Goldsmith, Edmund Burke, Giuseppe Baretti, Henry Thrale, David Garrick and fellow artist Angelica Kauffmann. Because of his popularity as a portrait painter, Reynolds enjoyed constant interaction with the wealthy and famous men and women of the day and it was through Reynolds that Thomas Beach was introduced to London Society and enhanced his own reputation as a portrait painter 'who could always be relied upon to produce a good likeness'. At one time he lived in Charles Street, St James Square, removing thence to Wigmore Street. He had settled in Bath by 1769, then a favourite resort of the fashionable world where he spent most winters, and during the 1770's he spent the summers working peripatetically in neighbouring counties gaining much employment in painting portraits and portriat groups of sitters mainly from Dorset and Somerset. He was a member of the 'Incorporated Society of Artists' and sent two portraits from an address in Bath to the Society of Artists exhibition of 1772. He exhibited with the Society until 1783, becoming its vice-president in 1782 and president the following year. He also exhibited a total of 26 portraits at the Royal Academy mainly between 1785 to 1790 but he also submitted a portrait in 1797 of George Prince of Wales. 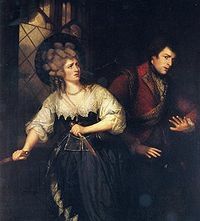 In one year 1783, he contributed no less than 16 portraits to the Exhibition of the Free Society of Artists including one of Mrs Sarah Siddons, of whom he painted several portraits, one with Mr John Philip Kemble in "Macbeth" shewn in the Royal Acadamy in 1786 (See picture), and another of Mrs Siddons alone in the same exhibition. many theatrical celebraties, Mr Henderson and Mr Jackson for example in the characters of Richard III and Duke of Buckingham were also painted by him, as was Woodfall the parliamentary reporter. There are several full length portraits by him at 'Shute House' the property of Sir Frederick De la Pole Bart. These family portraits are amongst his finest works. It is interesting that today reproductions of many of his pictures can be ordered across the internet from China. At this time he probably divided his practice between London and Bath residing circa 1795 to 1797 at the Strand-on-the-Green, near Kew Bridge. His early reliance on Reynolds's ideas of propriety gave way to a more direct approach, seen at its best in such group portraits as The Stapleton Family (1789; U. Bath, Holburne of Menstrie Mus.). In this work, the four children are shown in costume, as a fortune-teller and her customers. Beach's diary for 1798, the only one to have survived, chronicles one of his annual tours of the west country when he completed 31 portraits between June and December. Beach was able to capture a strong likeness and this, despite a certain naivety and awkwardness in composition, was enough to establish his reputation. He painted little after 1800 and retired to Dorchester. From the Rev William CHAFFIN (1733-1818) we know that the then Prince of Wales (later to become George IV) on a visit to Milton Abbey much admired a series of portraits done by Thomas Beach which were hung in the library and depicted all the officers of the Dorsetshire Yeoman Cavalry. Several of his pictures were engraved and this includes a portrait of George Damer,Viscount Milton, who was Colonel of the Dorchester Yeomen Cavalry which was engraved by John Jones in 1797. Given his close association with Milton Abbas and Lord Dorchester's family, he would have known and had an affinity with The Honourable Lady Damar (1748-1828) She was a very famous woman of this period and was born Anne Seymour the only child of Field Marshall Conway and she married at the age of 19 (1767) to The Hon John Damer the eldest son of Lord Dorchester. Unfortunately by 1774 she had separated from her husband, who was described as profligate, and he committed suicide by shooting himself in 1776. She was always a Lady of fashion and well known by the beautiful picture of her done by Sir Joshua Reynolds. In her widowhood she became an accomplished miniature painter and amateur sculptress. She was an Honorary Exhibitor at the Royal Academy Exhibitions where she showed 32 works which included 20 portriat busts, one of the earliest being her marble head of Lady Melbourne (1784). Her works were highly eulogised by Horace Walpole to whom she was the object of much admiration. He left "Strawberry Hill" to her for life. 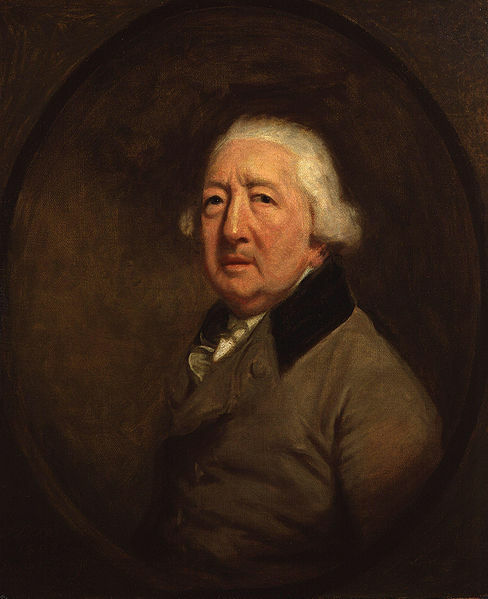 Thomas Beach's last recorded work in 1802, which was presumably painted whilst he was living in Dorchester, is a Self-portrait and now hangs in the National Portrait Gallery. An entry in the Gentleman's magazine records his death at Dorchester on 17th December 1806 and this was picked up by the Dictionary of National Biography and his now widely quoted. He was buried at All Saints Parish Church in Dorchester and the parish registers were transcribed in 1908 by the well known genealogist the Rev RG Bartelot. This shows that he was actually buried on 12th December so presumably died a few days before that date. Below is a brass memorial plaque to Thomas Beach originally erected in all Saints Church in 1905 but transferred to St Peters church when All Saints ceased to function where it can still be viewed today. The following obituary was published in the monthly magazine of the 'British Register'. Died. At Dorchester, T Beach, esq. many years an eminent portrait-painter, of Bath, 68. He was a native of Milton Abbey, a village since converted into a noble mansion of the Earl of Dorchester. From his earliest years, Mr Beach evinced a strong desire to be an artist; and under the patronage of the Dorchester family, he became a pupil to Sir Joshua Reynolds, in the year 1760. How well he succeeded under that great master, his works which in the neighbourhood of Bath are very numerous, will fully testify; the pictures which he painted about twenty years ago were certainly executed in the happiest periods of his pencil; though a late performance, a portrait of Dr Harrington (from which an excellent mezzotinte has been engraved), must be equally admired. His most celebrated work is a large picture of the domestics in the service of the late H.H.COXE Esq of Penmore. This picture is now in the possession of Sir J.C.Hippesley, of Stoneaston. No one can contemplate this performance without hesitating which most to prefer, the hand of the master or the pupil. To Mr B's professional excellence we must add that no man ever possessed a more friendly and benevolent difposition; he was a good scholar, and exemplary in the exercise of religion and charity; yet no man more enjoyed the social circle or more contributed to its mirth. (6). Captain Sir George Montagu, 1750-1829 Painted circa 1780-90 - Commander of the 'Pearl' he captured the Spanish frigate 'Santa Monica', 28 guns, in 1779 and in the following year the large French privateer, 'Espèrance', 32 guns. (6). Bryan's Dictionary of Painters and Engravers by Michael Bryan, edited by Robert Edmund Graves and Sir Walter Armstrong, an 1889 publication now in the public domain. (9). Wm Chaffin - Alumni Cantabrigienses. London, England: Cambridge University Press, 1922-1954. (12). 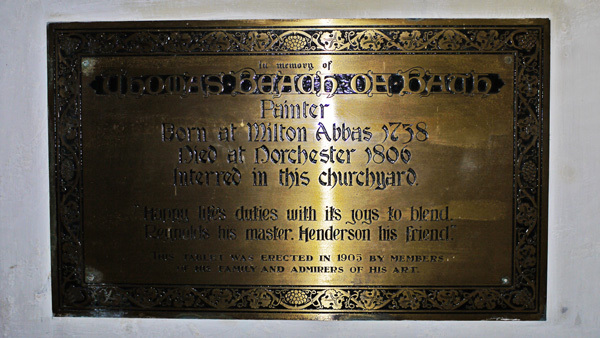 Dorset History Center ( PE/DO/AS/CW/4/3 31 Jan 1905) authorisation of a brass tablet in memory of Thomas Beach in all Saints Church.